In the North end of the Outer Banks, far from the more commercially dense areas of Kitty Hawk and Nags Head, it’s a common assumption that your only option is to rent a house for a week. 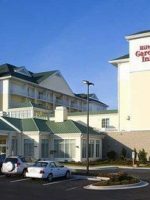 But for small families, or those who just need a weekend getaway, or even those who want to enjoy the quiet of the Northern Outer Banks while still experiencing the comforts of a full-service hotel, there is another choice: the Hampton Inn & Suites Outer Banks in Corolla. With plenty of options in terms of pools, gyms, spas and nearby historical attractions like the famous Whalehead Club and Wright Brothers Monument, we recommend you bring a calendar and don’t miss a thing. And did we mention, children 18 and under stay free? It is important to note that there is no onsite restaurant but there are ways around that, which we cover in Family Dining. For those of you who don’t want to deal with traffic, you can book a regional flight into the Corolla airport, which is literally across the street from the hotel. 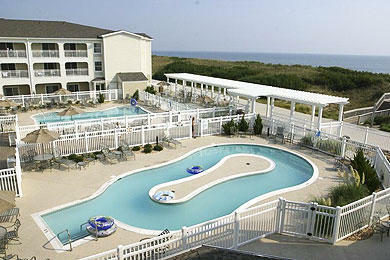 But for the rest of us, the hotel is about a half hour’s drive north of Kitty Hawk on Route 12. Once you are there, you will bask in the comfort of this peaceful, secluded and well-maintained getaway. Read more about Hampton Inn and Suites. 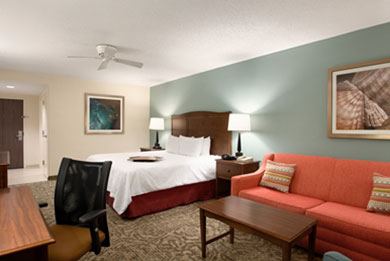 The Hampton Inn has two categories of rooms: the standard guestroom and the one-room Studio Suite. When making reservations, be sure to specify an ocean view room; the higher the level the better the view. Complimentary cribs are available upon request. The standard room has more than 400 square feet and features either one king or two queen beds in addition to a full-size sleeper sofa. Standard room amenities include microwave, refrigerator and coffee maker, private balcony or patios, free Wi-Fi and HBO and best of all, luxurious Cloud Nine mattresses. All rooms are guaranteed non-smoking. Be sure to request one of the rooms with a whirlpool tub. When you need to spread out a little more, the one-room Studio Suite is a great choice. In addition to the option of one king or two queens plus full-size sleeper sofa, the suites have extra square footage for lounging and also have a wet bar. Both categories have rooms available for visitors with special needs. We stayed here for 2 days with friends. The room had pool/oceanview, it was absolutely stunning, we woke up, looked out and saw jumping dolphins right in front of our room, so close in the ocean. The breakfast was ok, the pool looked a bit small but nice and clean. The lobby had a fire in the fireplace when we arrived for a last minute overnight trip to the outer banks. Our room was on the third floor overlooking the ocean. The balcony was a perfect place to sit and enjoy a glass of wine. When I went downstairs to ask the staff for a plastic cup, I was offered a freshly baked chocolate chip cookie. Bed was comfortable and the breakfast was nice. A pleasant getaway. The highlight of this hotel, and where we bet you'll spend most of your time, is on the private beach just a few yards from the front door. If you're up for activities beyond walking, swimming and building sand castles, the hotel concierge can arrange for a number of activities through local outfitters including jet skis, parasailing, fishing and sailing. 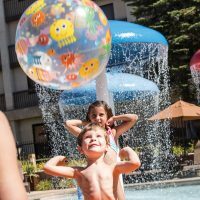 The hotel features three pools; one outdoor pool, one outdoor lazy river pool (which is also shallow enough for young children) and an indoor heated pool. 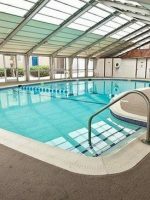 The indoor heated pool is open year round and is next to a game room and indoor workout room with treadmills. 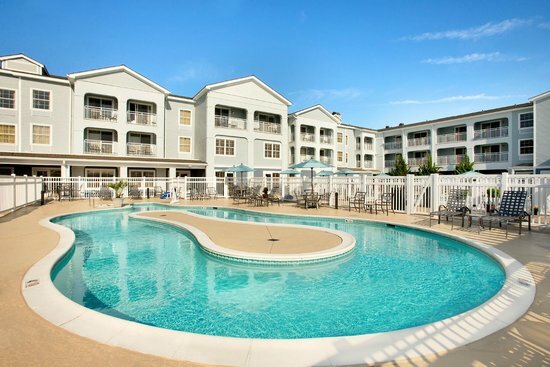 Guests of the Hampton Inn also have access to the Pine Island Racquet and Fitness club at discounted rates. Contact guest services for court reservations. Guests can also take advantage of the biking and jogging trails that run along the beach -- bike rentals are obtained through the front desk. Corolla is known around the country for its wild horse preserves and people come from all over to see the wild mustangs grazing near the beach and galloping between beach houses. 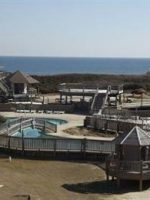 Be sure to visit the Corolla wild horse preserve. If there is one shortcoming of this hotel, it's the lack of an onsite restaurant. 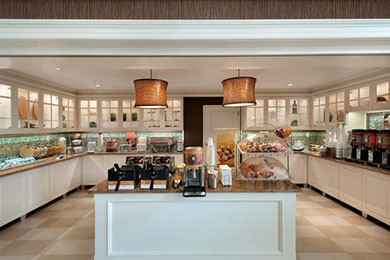 They make up for this, or at least they attempt to, by providing a complimentary all-you-can-eat hot breakfast, with cereals, pastries, a rotating menu of hot items like eggs and waffles, yogurt, juice, coffee and tea. You can also stock on up snacks and drinks at the local grocery store, Harris Teeter. There is also a nicely stocked 24-hour convenience store in the hotel called the Suite Shop. The suites and guestrooms have microwaves and refrigerators, but no cooking equipment or utensils. For meals off the property, there is a diner next door that serves breakfast, lunch and dinner. A 10-minute drive down the coast in the towns of Duck or Kill Devil Hills presents several options for family-friendly dining. Because there is no restaurant onsite be sure to pack any utensils you may need for carryout meals in your room, including plates, cups and bottle openers. If you are interested in spa appointments, or golf or tennis reservations at nearby clubs, it's best to book ahead of your arrival as these slots can fill up quickly. The hotel is open all year, the local amenities are not, however, including the next-door diner. Summer is peak season although if you can take the time off, we recommend visiting in April and May or September and October to beat the crowds and enjoy offseason rates. The nearest international airport is the Norfolk, VA, airport, which is 90 miles northeast of the Duck/Corolla area. Corolla is a 30-minute drive north from the Kitty Hawk area. 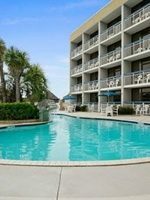 For visitors who don't want to deal with the hassle of the roads, FlightGest commercial air service has direct flights to Corolla and they land right across the street from the hotel. A vehicle is needed to travel to anything outside of the hotel but getting to the beach is an easy walk. Book a babysitter and head over to the Sanderling Spa, the posh couples' retreat that welcomes guests from the Hampton Inn for a little pampering. 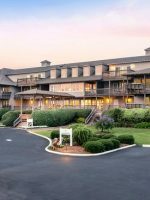 The Sanderling has a luxurious spa overlooking the Currituck Sound in nearby Duck, NC, with a complete menu of massage, body, skin and nail care treatments.